I don't have a bundt pan. I'd kill to have one. Really. Tell me who, I'll bring my razor along. That being said, I hope you'd be able to justify these cakes not with how they are, but how they could have been (like Baker's Royale). Treat it like you would treat your gothic teenager. This cake reminds me a lot of my kiddo days. Simply vanilla and chocolate was all I know, was all I thought i would ever eat, was all the flavors I thought existed. 60 cents worth of cake wrapped in clear plastic wrapper. 3 layers, no bigger than your 10 year old palm, each glued by chocolate chantility cream. I take on the slice layer by layer, up to the last layer, the last bite. The conquest was about to end, I was about to wake from the dream, it was unbearable. I wanted more, just one more. But no, there's always only 1 for each of us. No more, no less. It was a simple little treat. It wasn't a meal, it wasn't dessert. Just a break from the day. Just 10 minutes of silly chocolate-covered-teeth smile to let our mom know, we're happy today, we're doing fine today, thank you for today. I had to share this experience with you foodies. It's not always about how expensive the ingredients are. It's not about how pretty the cake is adorned. It's not the box or the wrapper it comes in. It's just us, the cake and that very day. Recipe from Baker's Royale. I've adapted for less butter, less sugar and more milk. Please try this out. I'm sure to bake this again. 1. Combine cake flour, baking powder, soda and salt together. Set Aside. 2. In another bowl, combine 1/2 cup of sugar, cocoa and water. Mix until smooth. Set aside. 3. Combine butter, 1 cup of sugar (remaining sugar) and mix for 1 minute. 4. Add the eggs one at a time, mixing 1 minute each addition. 7. Butter a bundt/angle food cake pan generously. Scoop 2 spoonful of white batter starting at one corner. In the middle of the white batter, add 1 spoonful of the chocolate batter. The batter will spread on it own. 8. Shake pan if lop-sided and bake in the centre for 50-60 minutes, testing with a wooden skewer at several places should come out clean. 9. Cool in pan for 15 minutes before removing from pan. "It's not about how pretty the cake is adorned" - that is definitely one pretty cake! 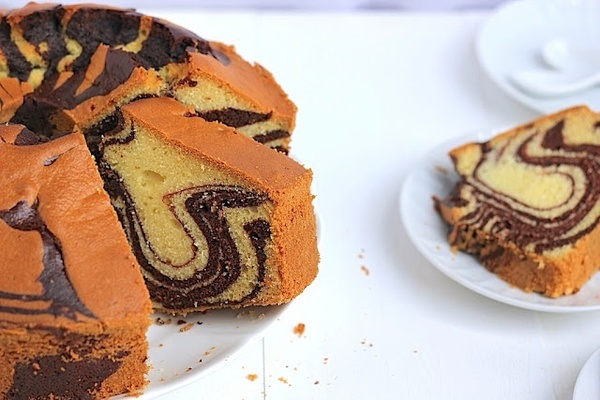 I LOVE this cake - those zebra stripes make me feel like a little kid again and I bet it tastes delicious too. Bookmarking! @ thelittleloaf: Indeed! It's so simple and I mean kids nowadays wouldn't really have the chance to enjoy a good old black and white cake! I have always wanted to make this cake, but alas it is on the never ending to do list. Your marbling does look amazing-stunning presentation. Great classic flavors sometimes just really hit the spot. Great post! Also, making a cake for no special reason can make the day a little bit more special. Enjoy the weekend as well as that cake! This is one gorgeous cake!!! Thanks for the inspiration...I must make it!!! @ Lizzy: Thank you! "Gorgeous" wasn't in the plan. It turned out like all the other zebra cakes. Inspiring and adorable. Your cake came out looking so amazing. Love it! @ Live a Sweet Life: Thank you! so sweet of you! Now that is one stunning cake! 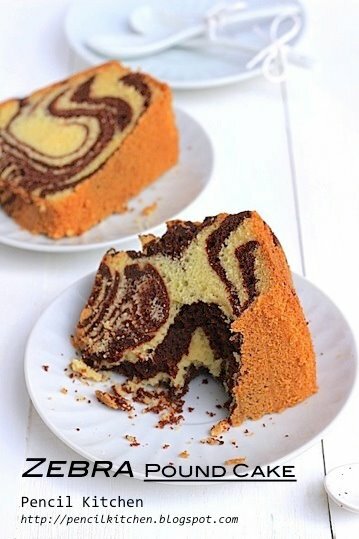 I keep meaning to try a zebra cake, but then getting lazy and making a standard marble instead... It really does seem worth the extra effort, though. Can I use 9 inch round pan instead? @ Anonymous: yes you can. but make sure the pan is 1-inch taller than the batter. Also if you're using a bundt pan, generously butter the pan and make sure to test with a wooden skewer at several places. Deeper cake = more baking time. This looks incredible!!! I need to make this right away!!! Love your site, can't wait to make this and to have a crafts day and make some of those wooden boards!!!!!!!! Thank you for sharing.